HAKEL provides surge protection for serial data lines to prevent damage to devices such as modems, fax machines, I/O ports, terminals, instrumentation, hubs, and any other devices that use serial data connections. Surges and spikes on datalines can fry your communications boards and corrupt data. This article describes the operation, installation and selection of what is probably the most common method of data line protection. Surge Suppressors divert excess energy away from the port being protected into a ground connection. The operation of these devices relies on a high quality ground connection in order to safely shunt away unwanted energy. Shunting harmful currents to ground before they reach the data port is the job of components such as Transient Voltage Suppressors (TVS, often referred to by the trade name Tranzorbs), Metal Oxide Varistors (MOV) or gas discharge tubes. These devices all work by turning on at a set voltage. Once the clamp voltage has been exceeded, the devices provide a low impedance connection between terminals. These shunting devices are most often installed from each data line to the local earth ground, and should be selected to begin conducting current at a voltage as close as possible above the system's normal communications level. For RS-422 and RS-485 systems, the voltage rating selected is typically 5 - 7 volts, in RS-232 systems 12 - 15 volt devices are appropriate. These devices typically add some capacitive load to the data lines, similar to adding additional cable to the system. This should be considered when designing a system by reducing the total allowable line length. Several hundred feet is usually an adequate figure in RS-422 and RS-485 systems. Surge suppressors must be installed as close to the port to be protected as possible, and must have an extremely low impedance connection to the local earth ground of the unit being protected. This ground connection is crucial for proper operation, providing a shunt path for excess energy as well as a ground reference at the same potential as the host. In most cases, this means the ground connection should be made from the surge suppressor directly to the chassis of the host device. The use of surge protectors to protect sensitive equipment from lightning hits and surges on Ethernet data lines has become more important than ever with the advent of faster standards like 100 and 1000Base-T Ethernet. The faster data speeds have required equipment manufacturers to use fragile high speed components. The need to keep cost low has meant the Ethernet interface is now integrated onto the main PCB assembly, designs with minimal part count and the use of low cost (lower power) components. A surge that would have left an older “beefy” 10Base-T interface untouched could easily destroy a sensitive 100/1000Base-T interface. In the past if a 10BaseT interface was damaged, it was easily replaced at minimal cost. With modern equipment having integrated 100/1000Base-T interfaces, this is not the case anymore. The Motherboard or more likely the entire piece of equipment will need to be replaced. The risk of not using an external surge protector is higher than ever. The use of a surge protector on an Ethernet line is not without its consequences however. 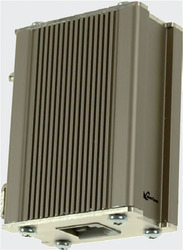 All Ethernet surge protectors will degrade the performance of the Ethernet line. The use of protective components that inherently have a capacitive component as well as the limitations of PCB layout techniques contribute to the degradation. The degradation is in the form of increases in line insertion loss, phase distortion, crosstalk, degraded common mode rejection, and possible ground loops. The use of two protectors on each end of the line will provide protection for each end against surges, at the cost of increased line loss and the possibility of introducing a ground loop into the line. HAKEL offers multistage surge protectors that offer much higher levels of surge protection compared to competitor’s products. These surge protectors will survive surges over 100 times higher than a standard design. The additional stages of protection do contribute higher losses however and will shorten the maximum line length over a single stage design.